Cut Paneer into long 1/2″ thick cubes. Cut all vegetables into cubes. Mix all ingredients for marinade and keep aside. Add the left marinade to the vegetables. Brush the marinade to the paneer and refrigerate it for 3 hours. Heat oil in a kadhai and fry marinated paneer till fully done. In a plate arrange fried vegetables and then paneer. 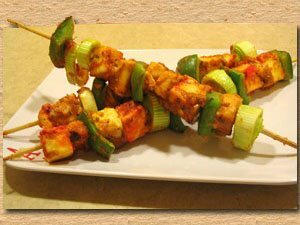 Serve tandoori paneer tikka hot with hari chutney.